An extremely active mid-winter pattern dealt another blow to Minnesota, with heavy snow, gusty winds, whiteout conditions in open country, falling temperatures, and dangerous wind chills. A strengthening low pressure system swung from southern Colorado into northern Texas on Wednesday February 6th, and then northeastward past St. Louis, Chicago, and Michigan by nightfall on Thursday February 7th. Normally this type of track would bring inclement winter weather only to far southeastern Minnesota; our state's big winter storms usually track 100-200 miles farther northwest, through Iowa and Wisconsin. This system, however, had a sprawling circulation, and was fueled by powerful jet stream winds in excess of 150 mph. The result was that accumulating snow over the entire state, with heavy snow affecting many different areas over a 24-hour period. 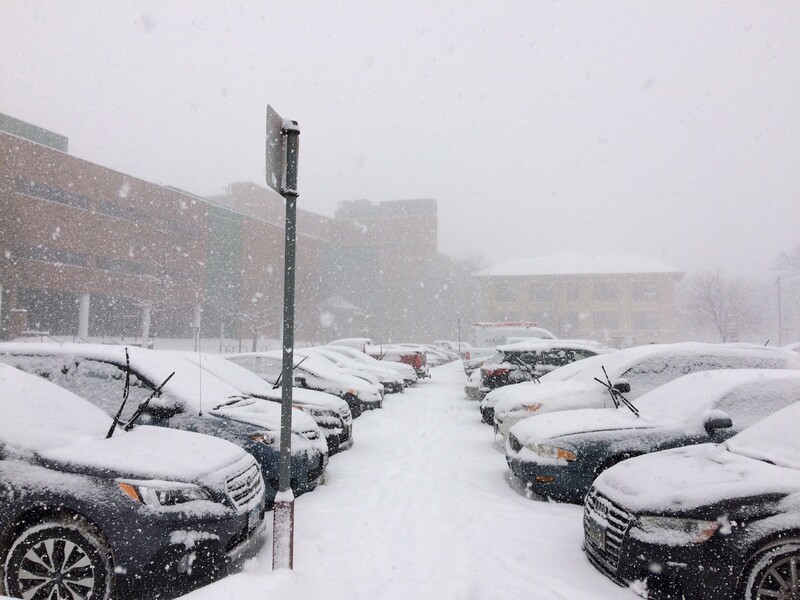 The storm had several distinct waves of heavy snow, affecting different areas at different times. The first formed on Wednesday afternoon over northwestern Minnesota, lasting into and through the night in some areas. By Thursday morning, accumulations of 6-12 were found in a swath covering Moorhead, Ada, Leech Lake, Bemidji, Red Lake, and Bigfork--extending right up to the Rainy River. Later Wednesday evening, isolated thunderstorms with sleet and snow entered southern Minnesota from Iowa. Although the lightning and thunder diminished rapidly, a quick wave of heavy snow spread northward across the state during the evening and overnight hours. This was followed by two much more substantial waves of heavy snow affecting the eastern half of Minnesota Thursday morning and afternoon. Snowfall rates exceeded 2 inches per hour at times from the St. Cloud area, into the Twin Cities area, and northward towards Duluth and the North Shore of Lake Superior. Although Minnesota has certainly seen larger and worse snowstorms, this one was unusual for the geographic coverage of its accumulating snows. Snowfall totals exceeding two inches covered the entire state, corner to corner, and about half of the state received at least six inches of snow. Select totals from around the state included 11.0 inches at Ada in northwestern Minnesota; 12.4 inches near Holyoke, south of Duluth, 12.0 inches near Cohasset, in the Grand Rapids area, and at Ponemah on Lower Red Lake; 9 inches at Clearwater, southeast of St. Cloud, and at Zumbro Falls in southeastern Minnesota; 8.9 inches at the National Weather Service in Duluth; 8.5 inches at the National Weather Service office in Chanhassen; and 6.3 inches at the Twin Cities International Airport. Strong winds developed just behind the snow, with widespread gusts above 40 miles per hour in the open country of western, southwestern, and south-central Minnesota. These strong winds combined with the fresh, powdery snow cover, to produce whiteout conditions in many areas, making travel impossible. On Thursday afternoon, National Weather Service had issued Blizzard Warnings for 34 counties in northwestern, west-central, southwestern, and south-central Minnesota. The strong northwesterly winds caused the temperatures to tumble quickly, often from the 10s or 20s F, into the single digits above or below zero in the span of 2-3 hours. The winds continued through the evening and into the night, leading to progressively lower temperatures. Wind chill temperatures fell into the -20s and -30s in western Minnesota on Thursday afternoon, and bottomed out in the -30s and -40s statewide early on Friday. As with other recent winter weather events, this storm led to early releases and cancellations for schools on Thursday February 7, with many schools closed or delayed on Friday February 8th because of the cold and wind chills.